Folks, this show is just going to be a blast. 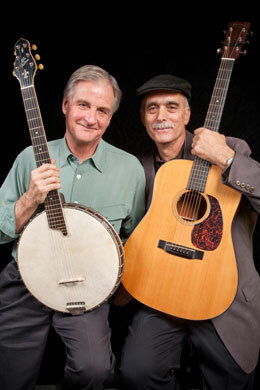 Join two true masters of American home-grown music, Jim Kweskin and Geoff Muldaur, as they reunite for a rare duo appearance to celebrate the release of the DVD, Chasin' Gus' Ghost, a documentary on the history of jug band music. Bringing those same roots to life on our stage, Jim and Geoff treat ears and toes to a superlative selection of good-time tunes. Famed 1960s folk revival heroes, the Jim Kweskin Jug Band, parlayed their good-time music at venues from Cambridge coffeehouses to the Newport Folk Festival to the psychedelic ballrooms of San Francisco, where they shared billing with the likes of Big Brother and the Holding Company and the Doors. Jim led the band on guitar and vocals, shaping its good-humored mix of old-time folk, jazz, blues, and 1920s and '30s "whoopie music." As a founding member and lead singer of two seminal groups, The Jim Kweskin Jug Band and Paul Butterfield's Better Days, Geoff earned a place in American musical history. Known for making traditional gospel, folk, and blues styles his own in an unusual process he calls "Muldaurizing," Geoff has also continued to write music for documentary film and horn arrangements (recently for B.B. King and Linda Thompson), and is a frequent guest on Garrison Keillor's A Prairie Home Companion. Tracing the roots of jug band music, beginning with Gus Cannon and Cannon's Jug Stompers, The Memphis Jug Band, and the Dixieland Jug Blowers from the 1920's, the film Chasin' Gus' Ghost weaves a tapestry through interviews, live performances, archival footage, and photographs showing their influence on the ever-popular folk and rock movements of the 1960's. The movie is written and directed by independent filmmaker Todd Kwait.